Once again on 17 November 2018 the most important truffle market in all Europe opened in Richerenches. It was officially opened by the “Brotherhood of the Black Diamond” last Saturday. Richerenches is a small village nestled around its Templar fortress and is the truffle French capital. Every year tonnes of this unique mushroom are sold there, ready to get to the connoisseurs’ table all over the world. All dressed in black the members of the brotherhood parade through the village streets to the sound of a typical Provencal fanfare. From now on the Richerenches truffle market will take place every Saturday morning until 23 March 2019. 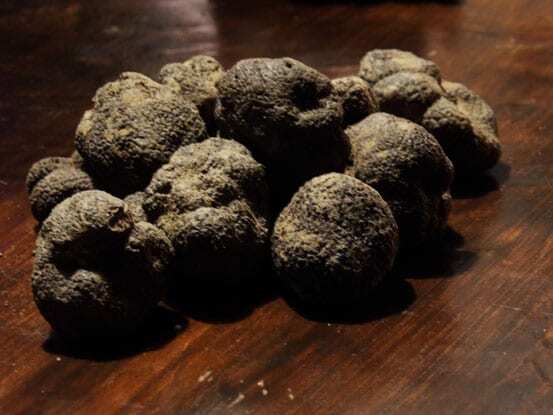 During these few months, truffle growers, traders and mere amateurs will feel, smell, sell and buy this black delight that mysteriously attracts gourmets, making them ready to pay indecent sums of money to get it. But, as the French saying goes, “when one loves, one doesn’t count”! Enjoying a festive atmosphere local people as well as buyers and tourists from the whole planet meet to share their common passion for the famous Tuber Melanosporum, the Queen of all truffle species, fondly shortened in “melano” by regulars. 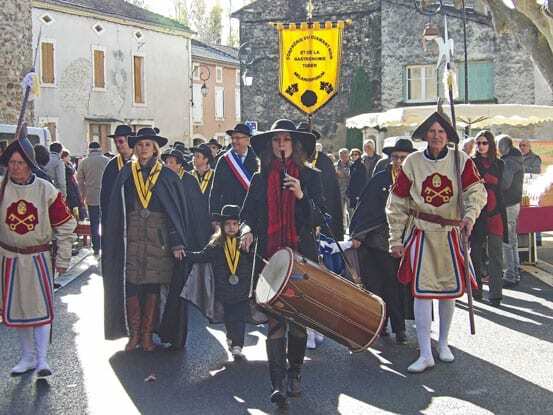 Here in Provence you will look like a true amateur if you call it “rabasse”, or even better “lou rabasso” in Occitan language, this ancient Southern-speaking. But, whatever the name, taste is an international language and all gourmets gathered to share a truffle omelette smelling “Oh” so good! For some truffle is a very serious business. To truffle growers and to traders who will sell the truffles to classy restaurants and delicatessens far beyond France’s borders, these market days mean big money. These exchanges take place in a quiet little street where traders park their vans along one of the Templar fortress wall. No big fuss here. Standing next to their open back trunk door they wait for the truffle growers who discreetly arrive carrying a small basket or a simple plastic bag filled with their weekly production. The vans’ back trunks are now turned into small shops with their essential instrument: a precision balance. Each gram counts! The buyer feels, smells, weighs and even cuts a small piece of the truffle with a sharp pocketknife to check its quality. Bargaining can now begin. Turning their back to possible viewers, talking in a low voice they eventually find an agreement and money discreetly changes hands. This one weights over 130g! On Richerenches’ main street things are very different. Here the truffle market is open to all customers and is much more lively. You will find here truffle in all its forms. Depending on their quality, the rarity or abundance of the production or the time of the year (Christmas time and New Year celebrations are a pick period), prices can double or even triple and, in any case, change every week. Actually, indulging oneself and buy a truffle for a special occasion can be quiet affordable and will turn simple scrambled eggs or a turkey into a festive dish. A 20 to 30 grams truffle is enough for four and will cost you approximately 20 Euros. All in all 400 kg of truffles were sold last Saturday (prices between 150 to 200 Euros for one kilogram). 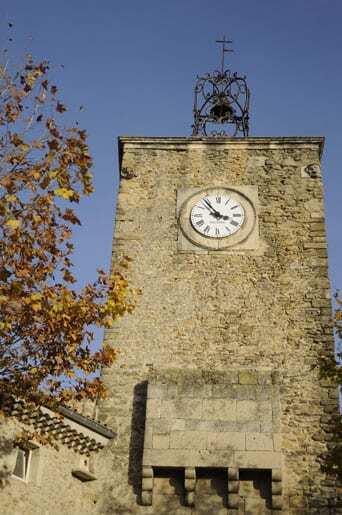 All winter long Provence’s heart beats to the rhythm of truffle markets in Richerenches and in many other lovely villages of the area such as Valréas or Grignan. A wonderful way to immerse oneself in the French truffle world! From late November till late March you can smell, eat, think and live the truffle way from dawn till late at night. 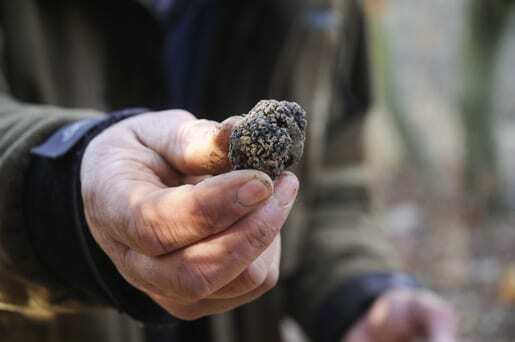 It all starts with a visit to a truffle grower. In Provence most truffles grow at the foot of a green or white oak. It is well known that these trees grow very slowly. This is the reason why growing truffle is a family business. As it is almost impossible to buy a truffle-field (very few people would think of selling their truffle field) people have to create it and in so doing they know that only the next generation will be able to profit from it. 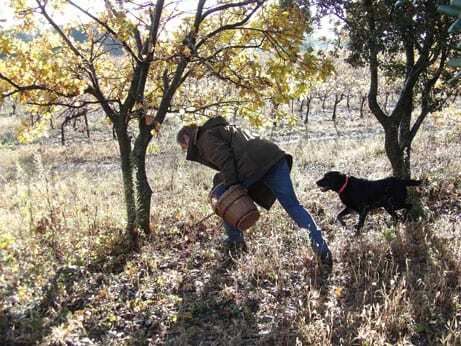 There are no schools where you can learn how to take care of truffle-oaks or to train a dog, the essential ally of the truffle grower. This knowledge is passed down from father to son and is a well kept secret. Why not go on a truffle hunt? 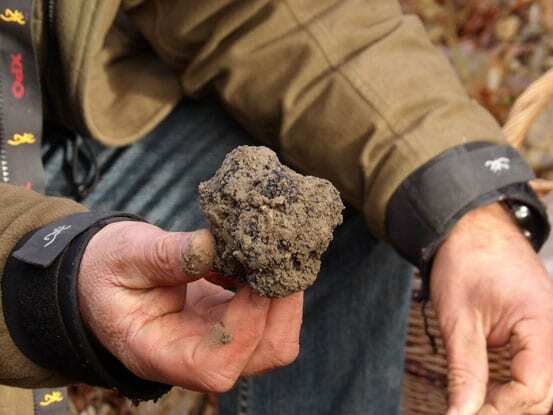 Many truffle growers invite tourists to watch them “hunt” the black mushrooms. Like hunters they take a well-trained dog to help them find the black treasure. Watching the man and his dog work together is absolutely fascinating. They are more than a team they live in symbiosis! The way they communicate with one another, exchanging glances, sensitive to the slightest wave of the hand or the paw, makes you realize the amount of training and love needed to reach such a level of perfection. With his nose low to the ground, scampering along from one tree to the other, the dog keeps searching then suddenly stops, scrapes the ground and sits still, waiting for his master to dig the ground with a special wrought iron pick. Once found the truffle is gently put inside a basket. All the while the dog is lovingly yet demandingly watching the kneeling man, impatiently waiting for his reward. A little treat, a stroke and the dog is already on his way for his next find. 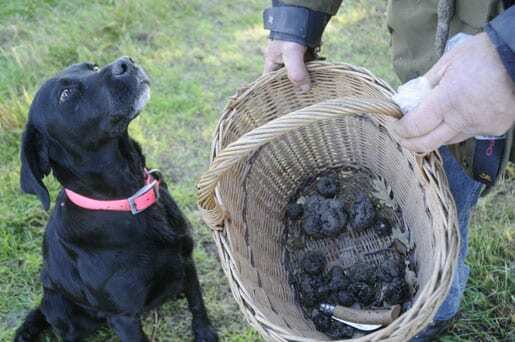 This truffle hunt is called “cavage”, a local name that means digging. Nicolas Pailhes is a young chef who knows how to get the best from truffles. Mixing classical recipes with innovating creations he concocts different menus that continually change, depending on the seasonal produce. From appetizer to dessert he makes tempting whole truffle meals and don’t expect homeopathic doses from this generous man! 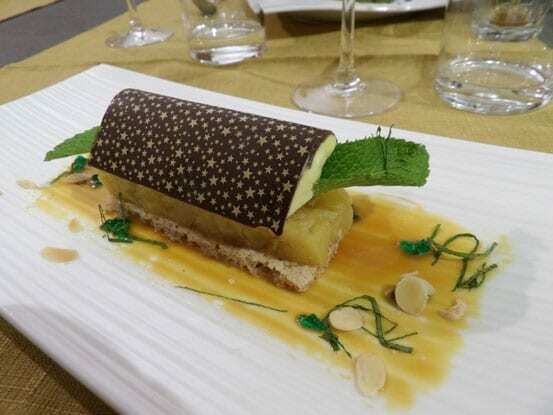 His restaurant “L’Escapade” is in Richerenches village centre. 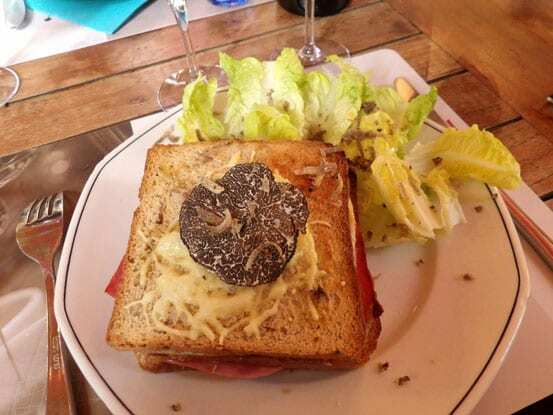 “Le Café de la Paix” is a friendly brasserie where truffle is a must in wintertime. 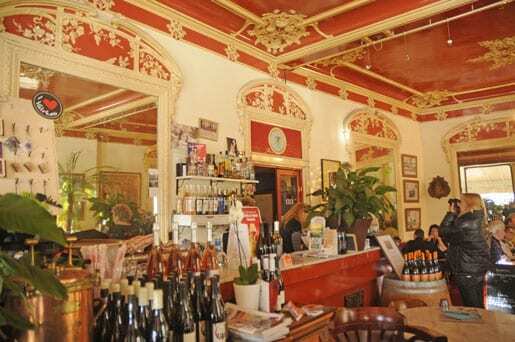 Don’t be put off by its charmless façade, the dining hall is exceptional with its Art Nouveau mouldings that are classified as historic monument. Without any fuss the chef makes truffle the queen of his dishes from appetizer to dessert. Why not have his tasty truffle “brouillade”, the luxury local version of scrambled eggs? “Café de la Paix”, 26 rue de l’Hôtel de Ville, Valreas.